I've invited many volunteers and interns to look at the web sites I host and create their own interpretation so others might understand me from their perspective. c) utilizes those references for targeted advertising campaigns, social networking, grant-writing, and the like. Even more to the point, this forum is a way of attempting to grow the idea of tutoring and mentoring to scale, or to a point where it "tips". 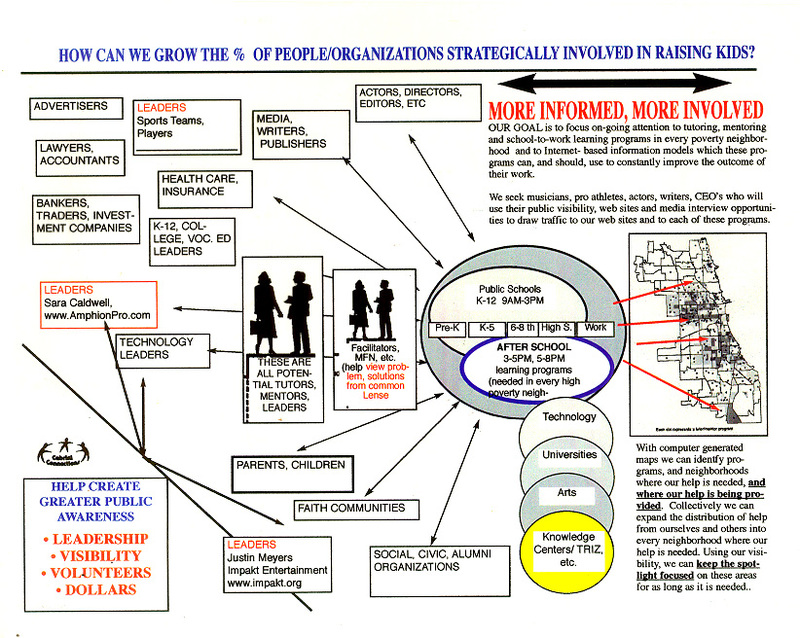 This graphic illustrates how anyone can be someone who "interacts with the information" and "with others", "producing more informed people". If informed people then build a "to do list" that they look at every day, they can remind themselves of ways to give their time, talent, dollars, in support of one or more youth serving organizations in the city where they live. 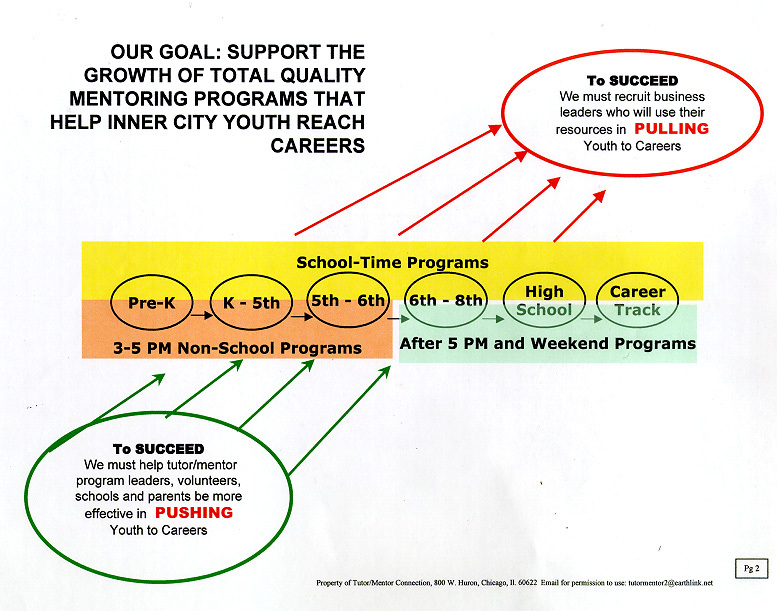 If enough people take a role in this process it can build a stream of on-going support that flows to every poverty neighborhood in Chicago and other urban areas, supporting the growth of a wide range of programs that help young people move from pre-school through high school and college/vocational school and into 21st century careers. 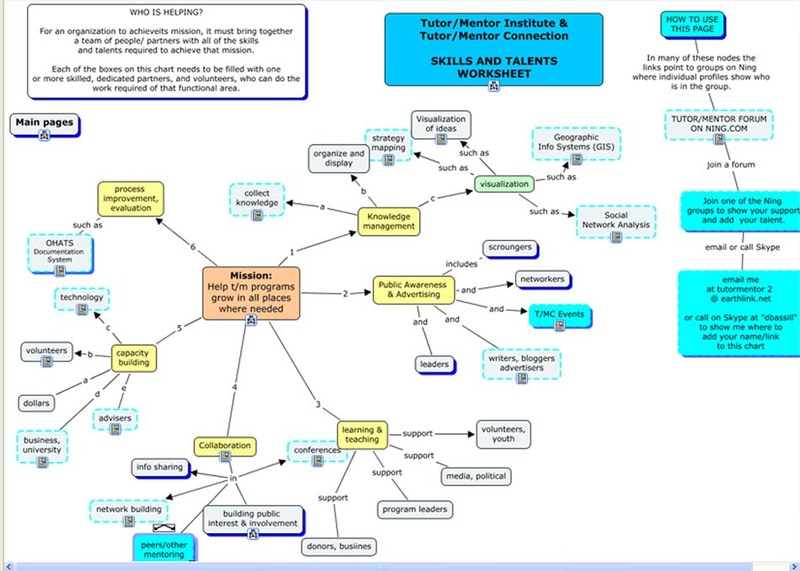 This page shows some of the projects interns have done to communicate the Tutor/Mentor Connection strategy. This blog introduces you to interns and the work they have done. Making Music. Getting it Heard. 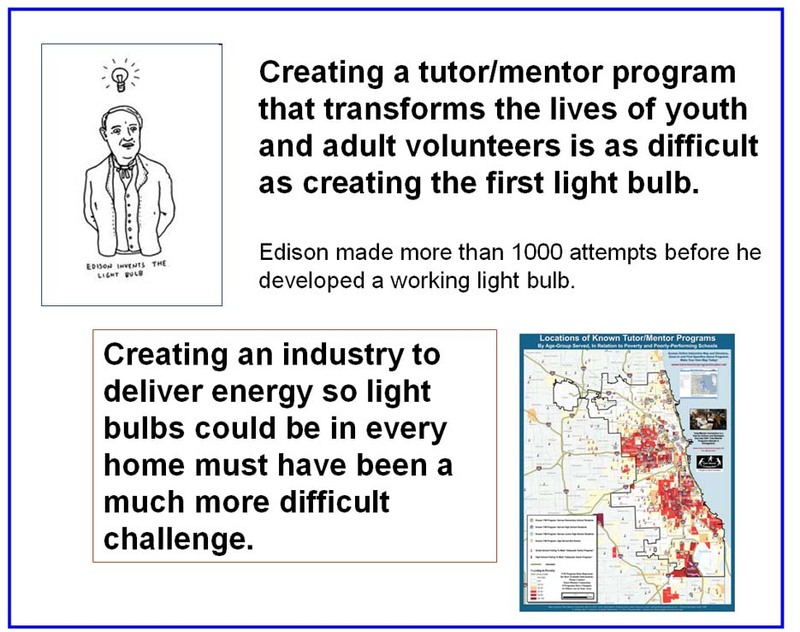 This is a new presentation created by Mina Song, an Intern from IIT, who has been with the Tutor/Mentor Institute, LLC in Chicago for the past three weeks. So, I've been innovating ways to get ideas into media and in front of more people for many years. 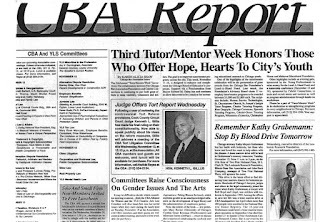 In this page you can see a number of news stories generated in the 1990s because we had help from a PR firm in Chicago and we were part of a youth mentoring program that also was a source of stories. However, through the last decade we had less help and fewer dollars so the types of ideas I've been generating depend on actions other people take to share these. Mina's presentation reviews some of those ideas and also illustrates how students can help in this communications effort. 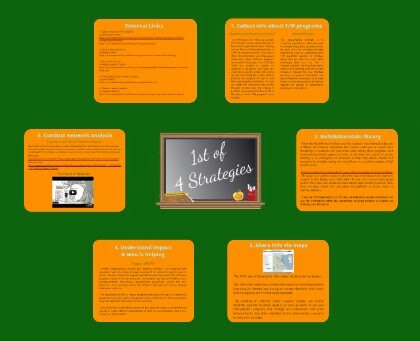 I hope you'll take a look and want to help develop some of these strategies. We're going into summer and many people will be near lakes and oceans. How many of you will be building sand castles? 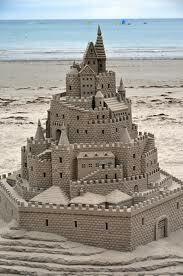 Have you ever stopped to think how many grains of sand go into just one small sand castle? What if you were just one of those grains of sand and you were trying to pull the rest together into one of these? That's how I feel in my efforts to connect with others in Chicago and the country who are concerned with the future and who understand that our children are our future. For more than 20 years I've been collecting and sharing information that can be used by anyone in the world to support their own efforts to help kids through school and into jobs and careers. I've been using maps, graphics, videos and the talent of interns and volunteers to organize and share this information and to encourage more people to use it. This map is one entry point anyone could use. 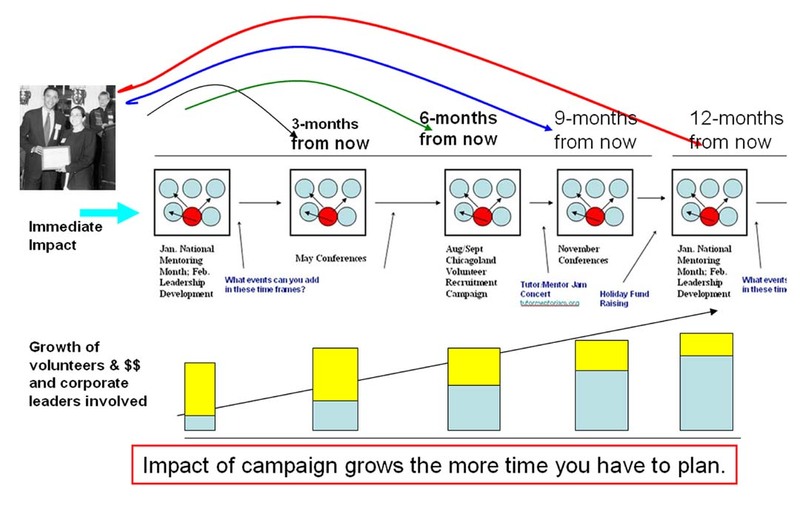 This graphic is from a presentation created this week by Mini Song, an intern from Korea. She spent a couple of days reading articles I've posted then did this presentation to share her understanding. 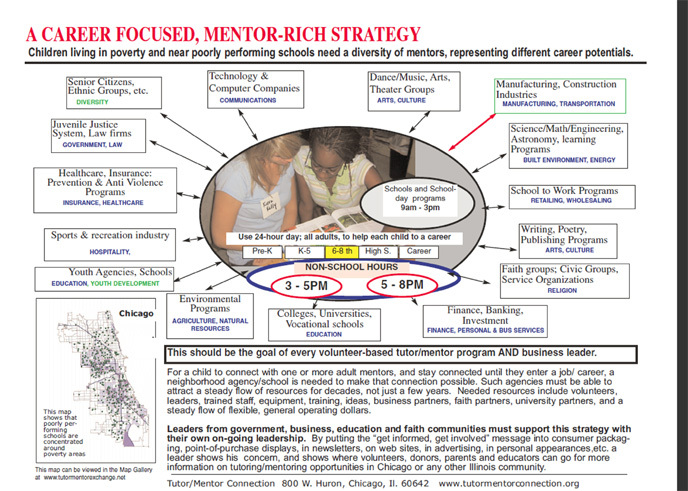 In past articles I've written about PLANNING and LEARNING and how it takes time and commitment and reflection to build an understanding of complex problems like poverty as well as complex systems that would help a growing number of kids living in poverty neighborhoods of Chicago get the extra support, mentoring and learning needed over a ten to 15 year period as the move from elementary school toward jobs. No one can digest all of this information in one visit to a web site or a conference. This needs to be an on-going process of learning, reflection, action, etc. Over the past 20 years I've developed a calendar of events that intend to draw people together, stimulate their thinking and help them build relationships with each other, while also attracting new people into this movement. Such people might start their own journey as a volunteer or donor in a tutor/mentor program, or as an organizer of an activity that connects a company, faith group or college team with one or more programs in a city. As you head into this weekend, my hope is that some of you will look at the Tutor/Mentor Conference being held on June 14 as an opportunity to connect and network with me and a few others. However, most of you can't attend the conference, but you can reach out to people in your network and start a discussion about the topics on the Debategraph map above. 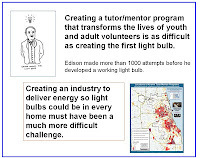 You can begin to think forward, looking at August, when advertising, social media, sermons, and web sites might tell stories of people involved in tutor/mentor programs so that more people might choose to become involved with one or more of the programs in Chicago or in your own city. You could look six months into the future and think of activities you might do in November to bring attention to tutor/mentor programs and draw financial support to them in December. 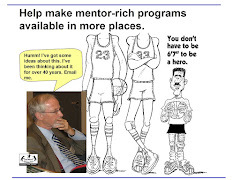 This article shows how lawyers in Chicago worked with me in the 1990s to create a Tutor/Mentor Week each November from 1995 to 2000. This could be duplicated by many groups in many cities, drawing resources to tutor/mentor programs from many sources. I've been using maps to show networks of people focusing on the well-being of kids. These also represent people and organizations I hope will participate in the conferences and web events I host, and who will invite me to join with them in their own thinking sessions. 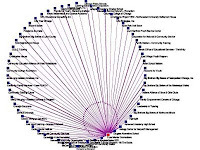 This map includes some of the organizations that are in intermediary roles, connecting networks of organizations. See the most recent version here. This map includes organizations who have come together for drop out prevention conferences. In the lower right hand corner you can see links to other networks focused on similar issues. The link to the map is here. If you're just a grain of sand within a small sand castle you don't have much gravity to pull all of the other grains together around your vision of the castle. Yet, if you write articles like this and post to Facebook, Twitter, and other social media on a daily basis like I do, you can draw some others together, and that's a start. The goal is that the network grows over time and that more people take roles that help make the information easier to understand, that increase the number of people looking at it, and that motivate daily actions that support individual youth serving organizations in many places. Of course, it's not the grain of sand that builds the castle, but some kids with help from Mom or Dad. That means you can help bring this vision together by your own efforts. If you've read this far, congratulations! Enjoy your weekend. 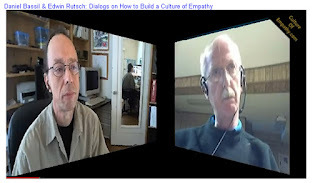 On Friday May 18, I connected on Skype with three of my friends to talk about what "empathy" means to you and how this translates to actions that help social benefit organizations reach more people who need help. The panel included Bert Ola Bergstrand who organized the Social Capital Forum on Facebook. The Social Capital Forum is an action and learning platform for developing social capital around the world. Social Capital Forum has also been instrumental in bringing the Impact Investment field into the Nordic countries and is hosting this years Social Capital World Forum. It also included Bill Huddleston, who has extensive non-profit and federal employee experience and now shows non-profits how to get the most out of the CFC or Combined Federal Campaign.(CFC). He shows non-profits how to use the CFC to generate unrestricted funds, and how to use workplace giving as an integral part of the non-profit’s leadership development program. He is the author of the soon to be released “CFC Fundraising Secrets, The Insider’s Guide to the Combined Federal Campaign” plus many articles on workplace giving and leadership development. His website and blog are at www.cfcfundraising.com and www.cfctreasures.wordpress.com. The panel was hosted by Edwin Rutsch who is founding director of the Center for Building a Culture of Empathy. Edwin posted the May 18 panel discussion on his web site - here. He also posted an earlier interview that he and I did - here. We'll be organizing more of these discussions in the future and I'd like to try to tie them into conferences and blog exchanges. Read more about the conference and blog exchange strategies. This video is a powerful call to action, with the message delivered by a teen. While more than 19 million people have viewed this my hope is that young people in schools, youth programs, faith groups, etc. will learn to add their own voices to this call to action so that every day in some neighborhood of the world some child is demanding that adults spend more time building a better future. 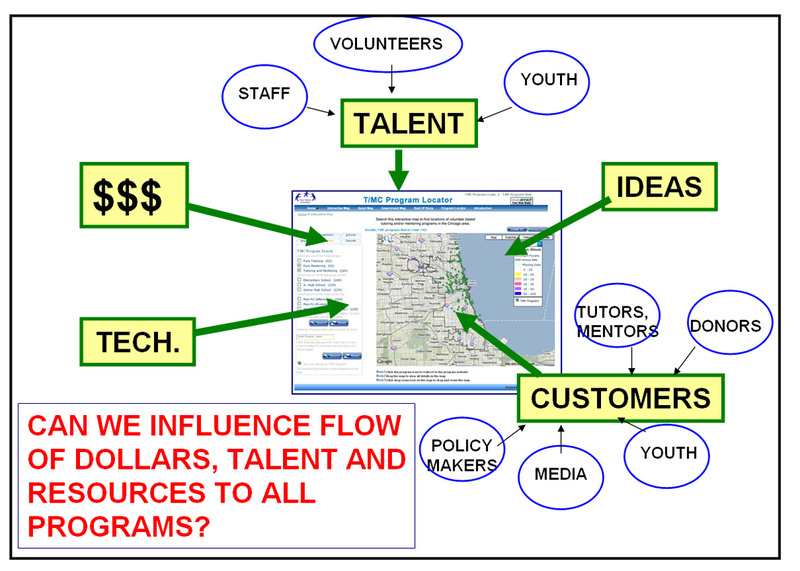 As I've led the Tutor/Mentor Connection I've used these videos to draw attention to maps showing where tutor/mentor programs were most needed, and pointing to web sites of programs already operating in the Chicago region who require a constant flow of talent, technology, ideas and operating dollars. 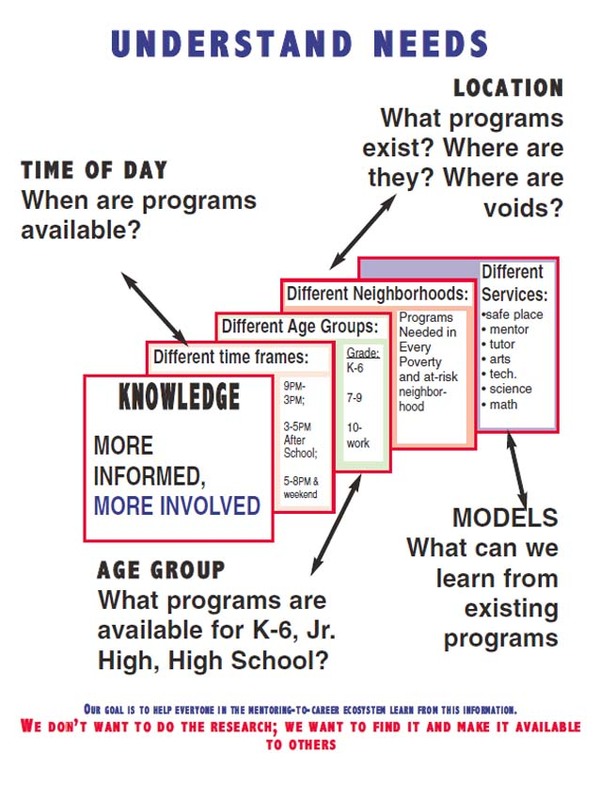 Interns have been helping me communicate strategies, with graphics like this which shows a problem-solving strategy that I hope local,national and global leaders are following to systematically develop solutions that can be sustained for dozens of years in neighborhoods all over the world. 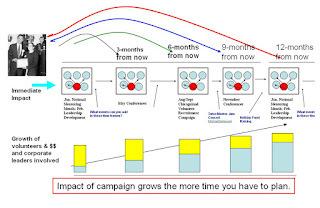 This strategy includes a public awareness/marketing component. Unless millions of people are being inspired in a variety of ways, on a continuous basis, to become involved in the work of making a better future, using their time, talent, dollars and votes, we'll never be able to build the better future we hope to leave to our own children and their children. In the June 14 Tutor/Mentor Conference being held in Chicago I'm looking for youth organizations who are teaching young people to take on advocacy roles like demonstrated in this video to be part of a panel where they share what they are doing and how they find the resources to do it. See the conference agenda for more on this. I've been participating in a Systems Thinking group on Linked in, where the moderator has begun to build a wiki to map the group's thinking. This type of moderation and systems thinking would be useful in all of the problem solving groups that are operating around the world. I'd like to find people with this talent to work with me to help organize the ideas I've been sharing on blogs, wikis, web sites and social media for the past 15 years. 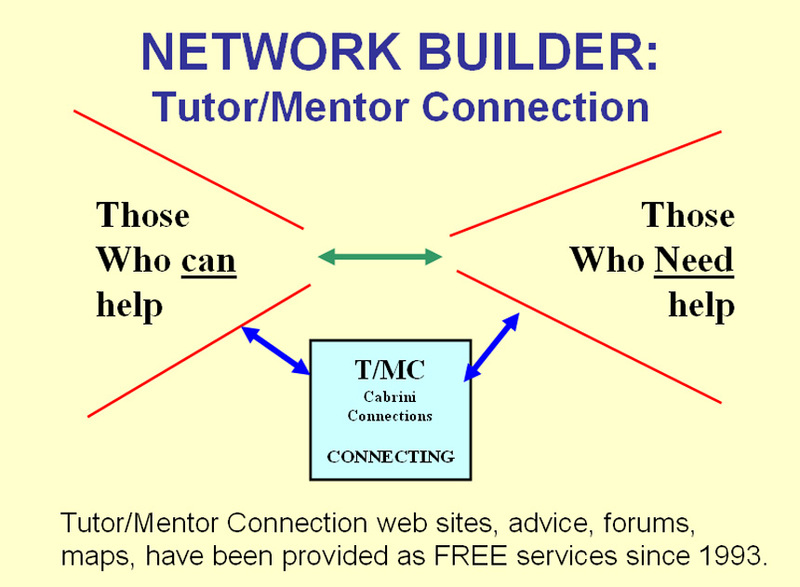 If you're interested you could connect with me on the Tutor/Mentor Connection forum on Ning or on Facebook. Early today I read this paper titled Conceptions of a Global Brain – An Historical Review which led me from the middle ages to a vision of the future. Then I just viewed this video from RSA Animate. I talk about building networks of purpose in blog articles and essays like this. I encourage you to browse these articles over the coming months...or even years. This learning process and network-building is not a sprint, but a journey. Mapping the networks that already exist is a different challenge than building the networks that need to exist to solve a complex problem. 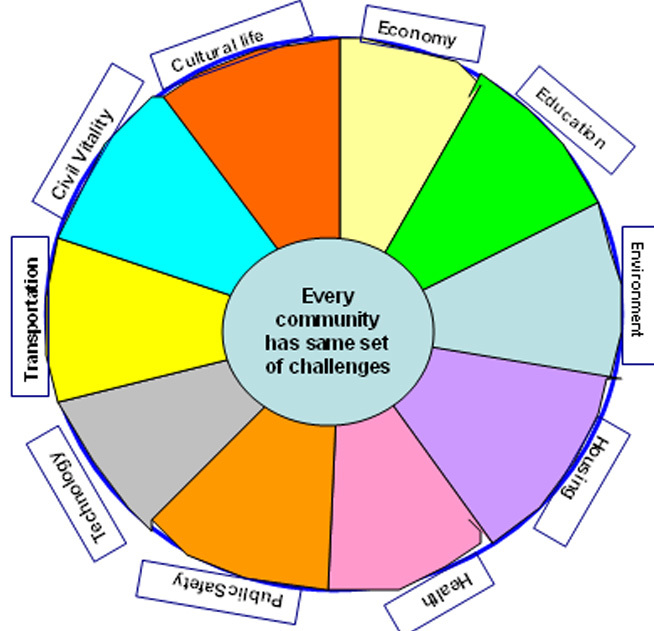 One requires extensive talent and manpower to map existing knowledge. The other requires a vision of what information and what people need to be involved, plus a perseverance and ability to communicate to a constantly expanding world of people and organizations who need to be involved. The network maps in the articles I've been viewing show that no one can do everything. However, we can be part of many things by the way we share ideas on our web sites and blogs and by how others add their own talent to our efforts while we add our talent to their efforts. 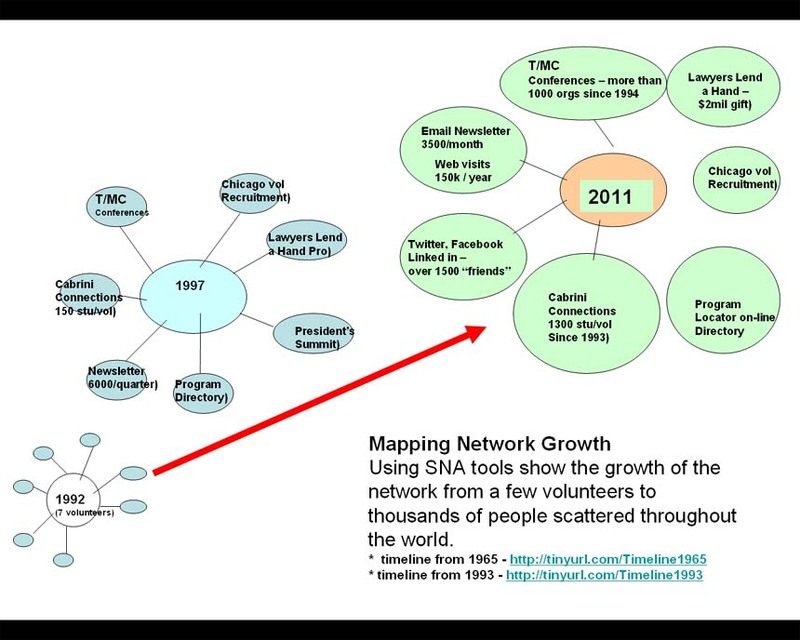 We need to harness the same tools use to map existing networks to show the growth of new networks and hopefully use this to demonstrate to donors the value of our network-building so they continue to supply the resources. 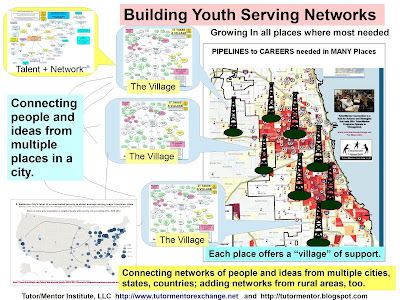 The image below shows the network of youth and adults connected over a 35 year period. 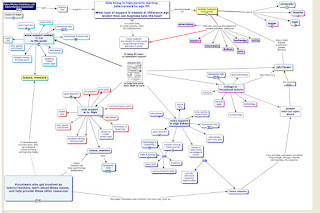 The map below shows a network of research articles aggregated in my web library over the past 20 years. 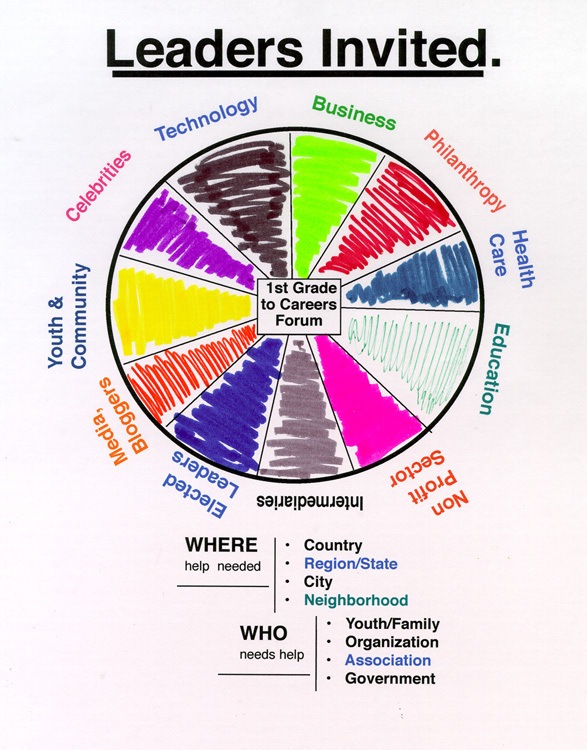 If you're interested in helping build this network, or map these ideas, or interested in helping expand the networks surrounding inner city kids, I look forward to connecting with you. The Future of Earth - Our Children. Is NATO talking about this? My friend Phil Jackson of The Black Star Project sent his email newsletter this morning. It included a story I pointed to Friday, about Education Redlining in New York City. It also included a story titled "Half of UK's young Black males are unemployed." With the big NATO meeting in Chicago today, and the G-8 meeting in Washington last week, I was prompted to create this graphic to suggest a type of platform that might connect those who are writing about bad news with those who are in the field leading organizations and schools that are trying to prepare youth to be the next generation of workers, along with CEOs and leaders, and those who are in decision-making seats right now and control the flow and distribution of resources needed to pay for what we do to shape our future. I joined a discussion on Linked in last week where a question is How can we enable a Systems Thinking World? I'm in similar discussion on Facebook (here and here) and have enjoyed many such discussion in other groups. If you narrow this down to "how do we support all kids from the time they are born to the time they are adults able to take care of themselves" which to me means they have a job so they can raise their own children without the challenges of highly segregated poverty and the knowledge of how to learn and work collectively with others as they move through their adult lives, then the first question I propose is "what do we know of the problem and what do we know of how others are already trying to solve this problem?" This is the first part of a problem solving strategy that I've posted among a set of articles in the Tutor/Mentor Institute, LLC library. 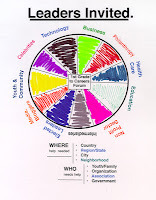 If we can create on-line platforms that support the components of the pie chart above, or the steps in the strategy PDF I've posted, can we find the marketing power to draw growing numbers of people into this strategy, help them understand it and lead them to on-going actions that support youth mentoring, tutoring, learning, etc. in all of the places where high poverty is a challenge that most other kids don't face every day? 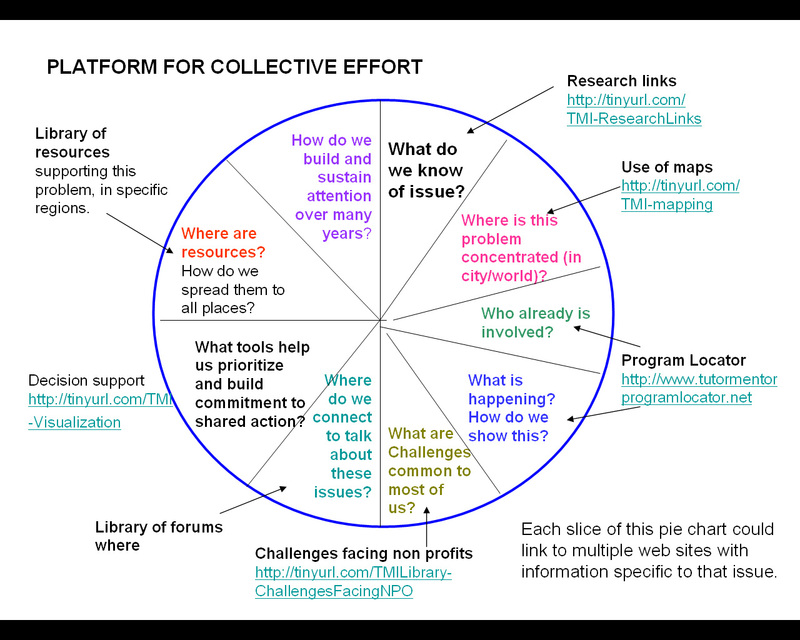 While I'm trying to find people to help me build a platform to support this work I realize that thousands of others are launching their own platforms for problem solving, social interaction, etc. every day. Thus we need to find ways to connect with each other, in many of the ways that are supported in this Change.MOOC.ca event which just concluded after over 30 weeks of shared learning. One of the organizers, Stephen Downs, just sent out a compilation of his Essays on meaning and learning networks . It's over 600 pages so I doubt many will read this completely while they fly home from the NATO summit. But what if they built this into an on-going learning course that was intended to teach more young people these ideas over a lifetime of learning? 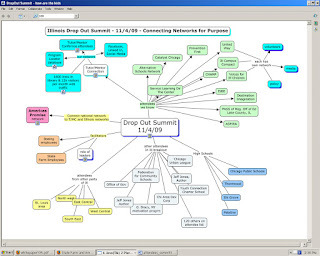 Such connected learners could then use web sites with graphic organizers like this to choose what cause they want to learn about, and click into a set of connected web sites that would take them deeper and deeper into knowledge about the problem and knowledge about possible solutions and ways they could apply them in their own communities and through the collective work of many stakeholders. If only one of the benefactors who paid for the NATO event, or who is paying for the attack advertising and political campaigns of this election year were to devote some funds to building these platforms and sustaining them for the next few election cycles, we might build a system where connected individuals work together to solve problems that governments have not figured out how to solve. I'm reading a report titled "Education Redlining in New York City". However, missing from the vision put forward by the Mayor and the New York Department of Education is any mention of what should be done to address the extremely high levels of segregation by race and class in the city’s neighborhoods and schools. Our leaders have known for some time that most of the “failing” schools in the city were located in the poorest neighborhoods and were serving the most disadvantaged children. So far, no effective action has been taken to begin to ameliorate these profound inequities. Over the weekend I encourage you to read with me if you're tired of reading about the NATO protests in Chicago. As you do, take a look at some of the other articles I write which are all intended to "increase the number of people who care enough to give serious time, talent and dollars on an ongoing basis to solve the problem." Leaders of NATO and aligned nations are in Chicago this week and will try to reach agreement on some big decisions. Do you think they do all the thinking, planning, brainstorming just while the leaders get together for a few days? I doubt it. 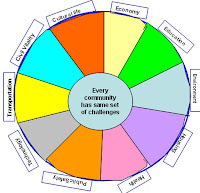 I'm certain that teams of people from each country have been meeting frequently throughout the year to try to find solutions to tough problems. With that being said, what sort of system connects the foundations, business leaders, policy makers, non profits, educators, and others who are trying to figure out ways to lower the costs of poverty and prepare more young people for roles in the global economy? 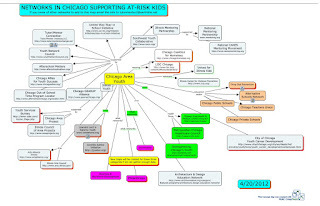 When leaders in Chicago and elsewhere say they want to help kids, I look for graphics like the one below on their web sites, illustrating the long-term commitment it takes to help kids through school and into careers. 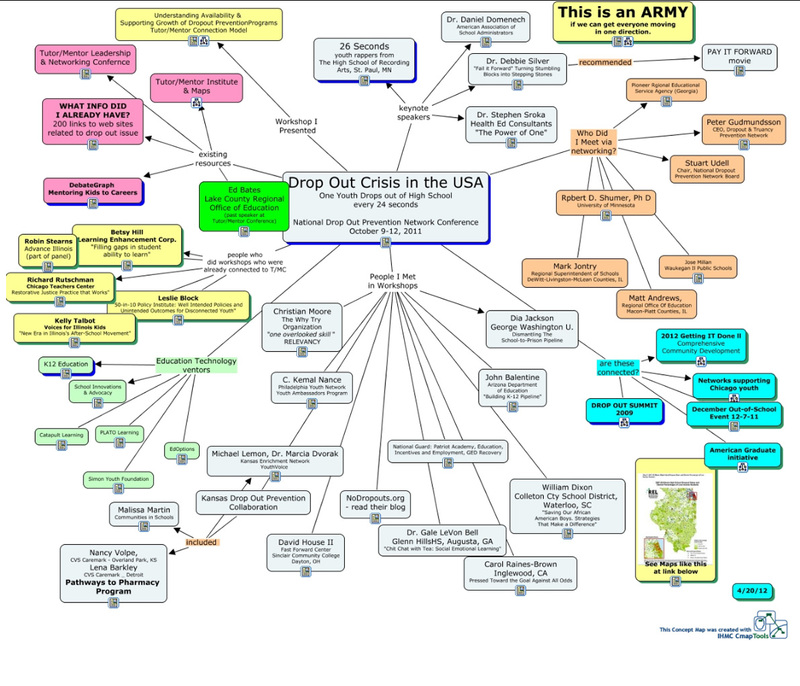 I post this map on my web site, with links to many other maps, so anyone in the world can use my sites as a platform for their own thinking and decision support. I support mentoring in volunteer-based tutor/mentor programs because it brings an extra network of adults into high poverty neighborhoods who can build a personal empathy and understanding of the challenges of poverty and who can begin to help young people access the range of learning supports they need, and which are taken for granted in more affluent areas. 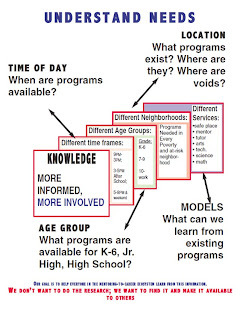 In order for volunteers to connect consistently with kids in high poverty areas of big cities and build this understanding, organized programs need to be in these places, to facilitate these connections. So what type of thinking is going on in all of the places where people are thinking about this problems? This is just one of many graphics I've created to try to segment this big problem into smaller problems. If you browse other articles on this blog, or even do a web search for "tutor/mentor" and then looked at the images page, you'd find dozens that I've created over the past 15 years. 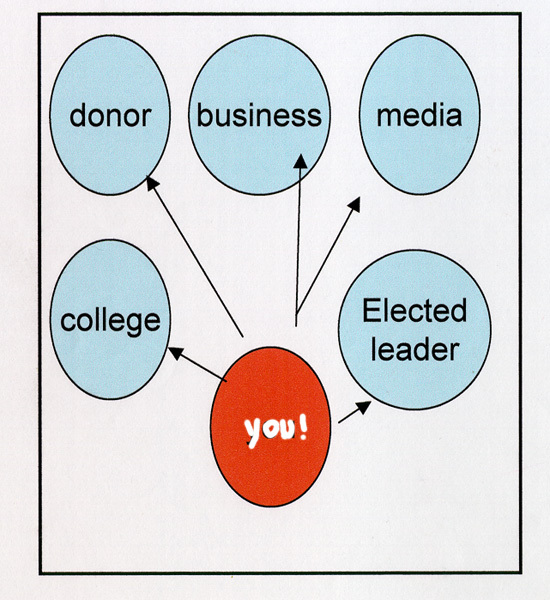 In the concept maps I've been able to create links to web libraries and web sites of other people. 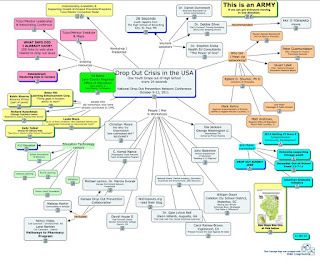 For instance if you look at the research map below,the links point to sections of my article with links to articles, blogs, research and ideas that any group can use to expand the range of information they have to support their own brainstorming. There are many groups focusing on issues of education, drop out crisis, youth development. However, I'm not able to find many places on the internet where these groups are connecting and talking to each other, and where they are looking at the same library of information. 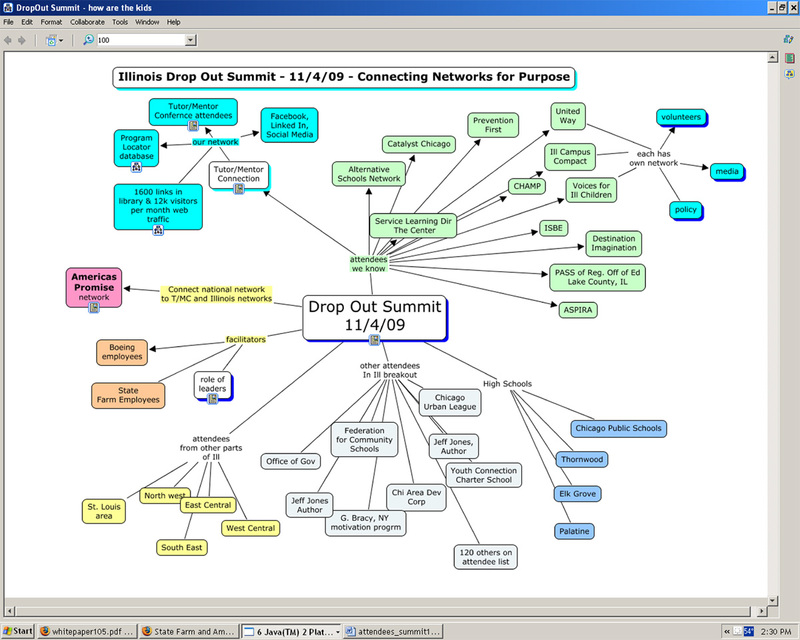 This is a concept map showing organizations, I've connected to via drop out conferences and similar events. See actual map. I've hosted a tutor/mentor conference in Chicago every six months since 1994 and I've sent invitations and email notices to most of the organizations in my library and shown on these maps, and many others, yet I still am only able to bring together 100-125 people. I'm sure that's because of a lack of money to market the events. I'm also sure it's because I'm not the Mayor, a big foundation or celebrity, or CEO of a big company. My next event is June 14 at First Unitarian Church in Hyde Park (Chicago). It's still being organized. It is just one of many gatherings taking place in June, which is another reason people can only attend a few of these. I wrote an article about this competition for participation back in February 2012. I don't think we every can get enough of everyone into the same room often enough to solve major problems, or build consistent support for tutor/mentor programs that need to last for 20 or more years. I do think that we can do learning on the Internet, if we can build platforms that motivate people from all sectors who are interested in the same problem to participate. I've been following this Change.MOOC an the Webheads community for a while. These are examples of connected learning groups that involve many people. In the library on the Tutor/Mentor Connection site and in the Tutor/Mentor Forum people can submit links to add new information. If there are web sites using maps and graphics like I do to support the work of people helping kids in poverty through school and into jobs and careers, please share them. If there are forums where resource providers, non profit leaders, researchers, and youth/parents actively participating in planning intended to make more non-school learning programs available in high poverty areas, please point them out to me so I can participate and share links to others. Supporting platforms like I'm describing takes talent, technology, even some dollars. If you'd like to help build and expand the platform I've been building for more than 18 years, I'd sure like to hear from you. 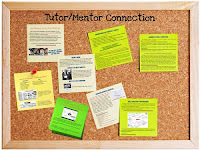 Take a look at more of the ideas I share in the Library on the Tutor/Mentor Institute, LLC site and by clicking into the tabs on this page. Tutor/Mentor Program Outcomes - What if? 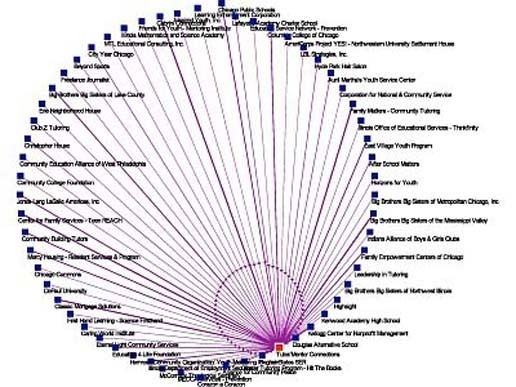 I have links to close to 200 Chicago area youth serving programs in the library on the Tutor/Mentor Connection web site. The goal is that leaders from business, media, religion, politics, etc. would find a way every day to encourage people who want to help kids in poverty areas move through school and into jobs to look at these sites, and choose one or more to support with time, talent or dollars. One of the Programs I've pointed to for a long time is Chicago Youth Programs, Inc. which has been operating at three sites in Chicago for close to 30 years. If you go to the "outcomes page" on their web site you'll see three sets of graphics. This is one of them. 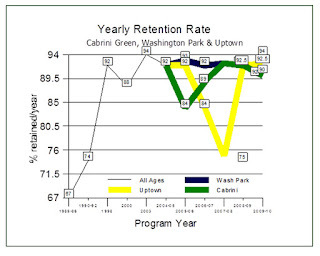 It would be great if every web site of every tutor/mentor program had similar charts showing participation, year-to-year retention, years of service, etc. That would give volunteers and common way to compare programs and how well they have been able to form bonds with kids and families and how well they can keep these in place for multiple years. I co-hosted a panel discussion in January 2012 and one of the speakers was Monique Cook-Bey, the Washington Park Program Director. You can listen to her describe her program in this video. I have hosted a Tutor/Mentor Leadership and Networking Conference every six months since 1994 to enable programs to come together and share ideas with each other. The next is June 14 and will be at First Unitarian Church in Hyde Park. Visit http://www.tutormentorconference.org for more information. This is a video created in 2008 by one of the interns who work with the Tutor/Mentor Connection and Tutor/Mentor Institute, LLC every six months in a six week internship at our Chicago office. 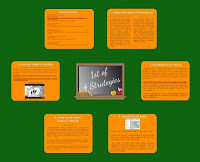 It shows how students from different places can create videos, blog articles, visualizations, etc. intended to help young people in other places. As NATO is gathering in Chicago this week, I hope young people from every Nato country are looking at material like this and seeing how they can contribute to world peace and community as the future they want. Note that the contact information for Tutor/Mentor Connection is changed because we're no longer part of Cabrini Connections. Mail info to: Tutor/Mentor Institute, LLC, Merchandise Mart PO Box 60654, Chicago, Il 60654. The email is still the same. New interns are starting this week. You can follow their work on this Ning forum. Better yet, you can be a virtual volunteer and join them! This is a video I created a year ago after Rahm Emanuel was elected. It shows leadership and strategy that needs to come from CEOs and civic leaders. While it focused on Chicago the reality is that every major city in the world has pockets of poverty where people are isolated from the opportunities of the rest of the city. As long as you're in Chicago this week, perhaps you will want to take a look. I've not been invited by anyone from the Chicago Mayor's office to come in and talk about these ideas, so maybe someone in your city will want to invest some time in learning how you might apply them. With the millions of dollars available to Mayors of big cities and corporate leaders, imagine how much more professional this video and others on the Tutor/Mentor Institute, LLC channel could be, if they were created by your production departments. Or you could view the articles I've posted at Scribd.com to show strategies leaders could take. Any of these could be re-built as more creative and professional presentations, delivered by Mayors, CEOs, celebrities and/or faith leaders. In fact, any of the over 1,000 articles I've written on this blog could be used as leadership sermons by people all over the world. That's the goal. Many leaders need to be sharing these ideas every day so more people take time to read, reflect and then begin to use their own time, talent and dollars to solve some of the problems facing big cities. After leading a volunteer-based tutor/mentor program for 35 years I'm convinced that providing a network of extra adult mentors, tutors and learning supports during non-school hours for kids in high poverty neighborhoods is essential. However, finding the dollars to do this in all of the places where these programs are needed, for the 20 years it takes to help a youth from first grade to first jobs requires a new way of thinking. I use visualizations to try to communicate these ideas. The general contractor who is in charge of building a skyscraper works with a team of professionals who provide the different skills needed to build the building. They all get paid or the work stops. 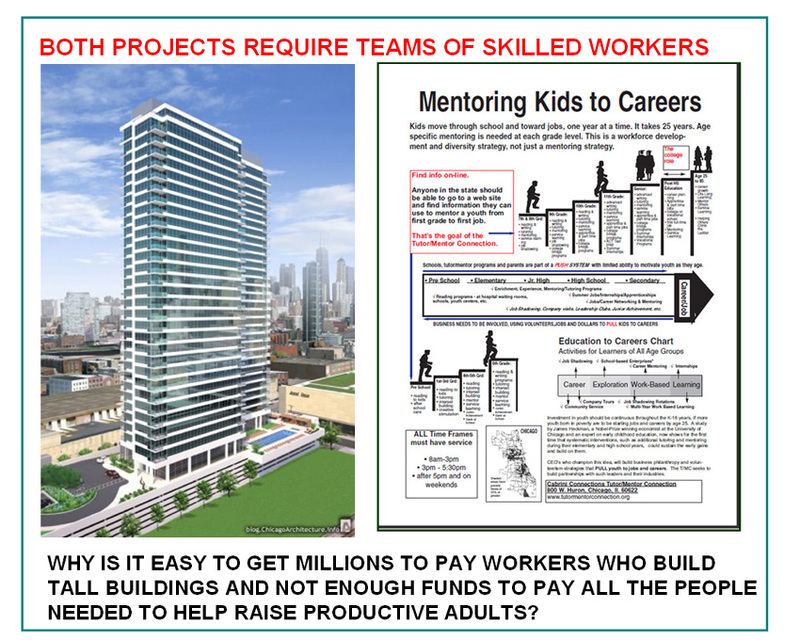 If you think of a tutor/mentor program leader as a general contractor, or a store manager, the team of people and talent that needs to come together year-after-year to provide age-appropriate supports and learning opportunities is just as diverse as the team building that skycrapper. However, the money to pay this talent and keep it involved for many years is not consistently available and not flowing to all of the neighborhoods and programs where kids need this type of extra support. 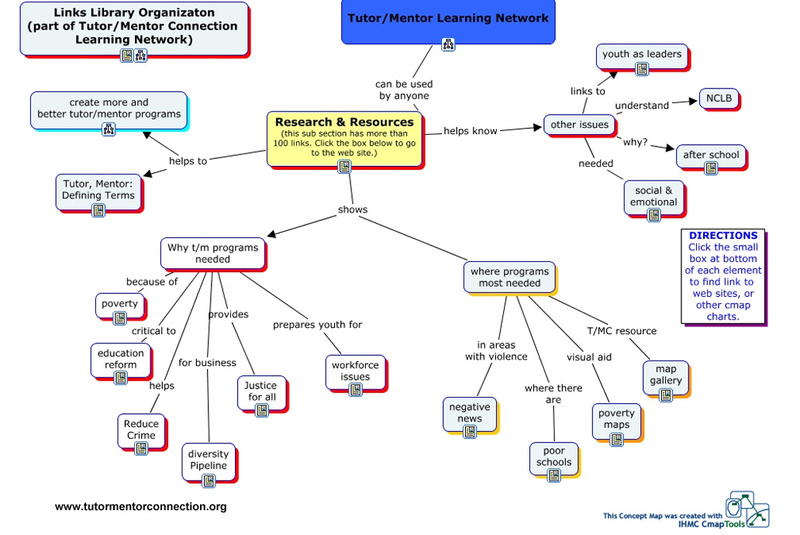 I've created concept maps to illustrate the range of supports kids need, and to show that volunteer tutors/mentors can be people who help bring these resources to a neighborhood. This graphic illustrates the many different sources of volunteers, dollars and support that need to be involved in raising future adults. 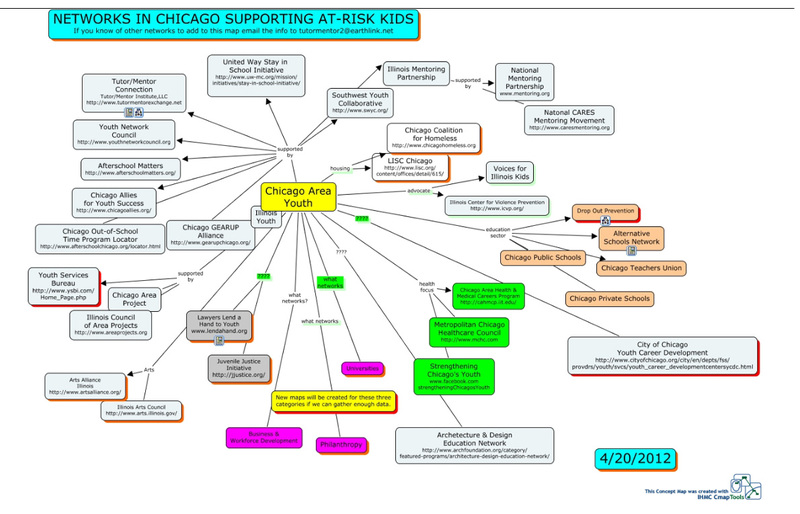 In other concept maps I show organizations in Chicago who focus on helping kids. Take a look at their web sites to see if they convey any of these ideas. I also show places where I connect with others. Every six months since May 1994 I've reached out through these networks and invited people to come together for a one or two-day networking conference. I've reached out to businesses and foundations asking for them to provide financial support. With the help of volunteers I've tried to create maps showing the range of people participating in these events. 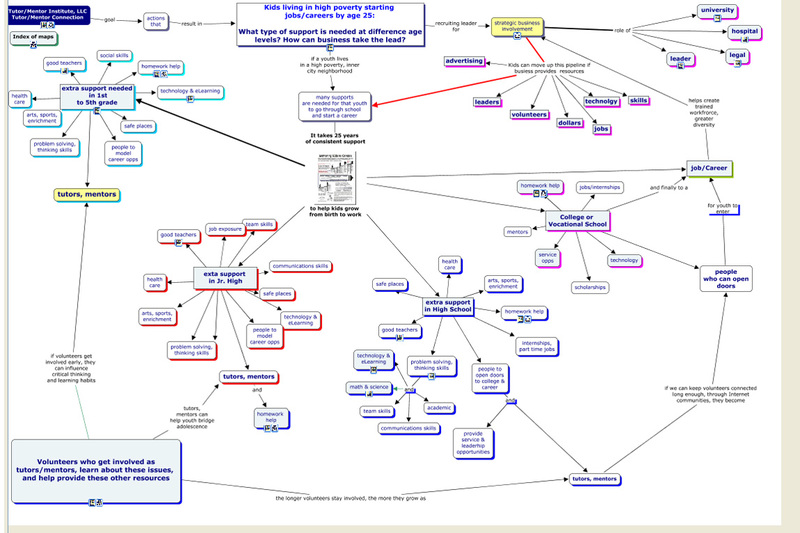 You can see more conference maps like this on this blog. They show who is responding from the invitations I send. The next conference is June 14 at First Unitarian Church. Here's the web site. http://www.tutormentorconference.org . I'm still organizing panels and would like to see some of the leaders from my network participate so we can build the funding based needed to support the teams of people needed to help raise future adults in neighborhoods throughout Chicago and other big cities. It also takes a team of talented people to do what I do. I don't have investors providing capital to pay the team of workers I describe in this visualization (see map here) so I depend on volunteers, interns and partners for this help. 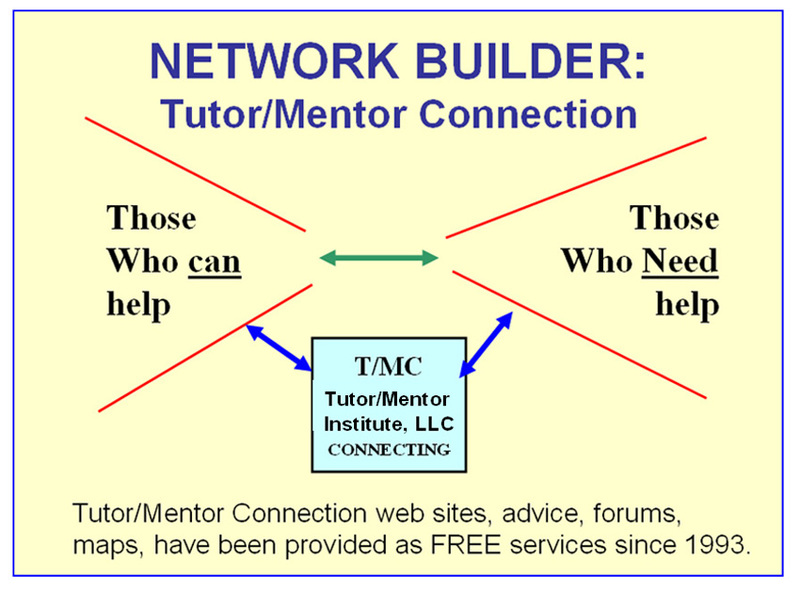 You can connect with me on Facebook, Twitter, Linked in or the Tutor/Mentor Connection forum. I've written many articles about the role of leadership and the process of adult learning in building a citywide network of non-school mentor-rich organizations that help youth stay in school, graduate and move on to jobs and careers. In this section of my library I post specific ideas for how Business, Hospitals, Universities and Faith groups might adopt these strategies in their own organizations. Yesterday I read a paper titled The Cyclical Process of Action Research which shows how groups of people are transformed as they work together to solve a problem. This paper uses a hypothetical example of converting an industrial site into a community garden to illustrate it's ideas. As I read this, I thought of how people working to make volunteer-based tutor/mentor programs available to youth living in high poverty might go through the same process, with the same benefits. Two animations created for me by interns illustrate this cycle. See here and here. Many companies are innovating new ways to hire and retain bright workers, and many are increasingly appreciating the value of volunteer involvement as a strategy for expanding the skills and informal networks of employees. 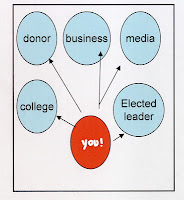 Thus, if CEOs who adopt this ROLE OF LEADERS strategy and encourage the development of employee/community teams focus on a) making tutor/mentor programs more available; b) sustaining them for many years; so that c) youth from these programs not only finish high school and go on to college and/or vocational education; d) many of them are supported by the network of adults who they have connected with in earlier years as a result of the volunteer-involvement as tutors/mentors. 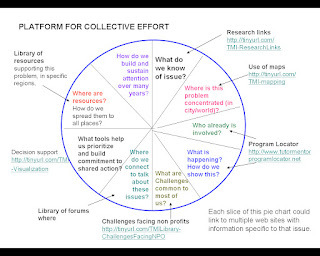 This action research process could be taking place in thousands of locations throughout the world, not just in the USA, and the teams in companies and organizations could be connected and learning from each other in a variety of on-line platforms. I'm sure this is happening in many places, but I don't know of a web site where I can find links to web sites showing the action planning process within a company, hospital, faith group, or university, focused on helping pull kids through school and into jobs over a 10 to 20 year period of consistent, but constantly changing, support. 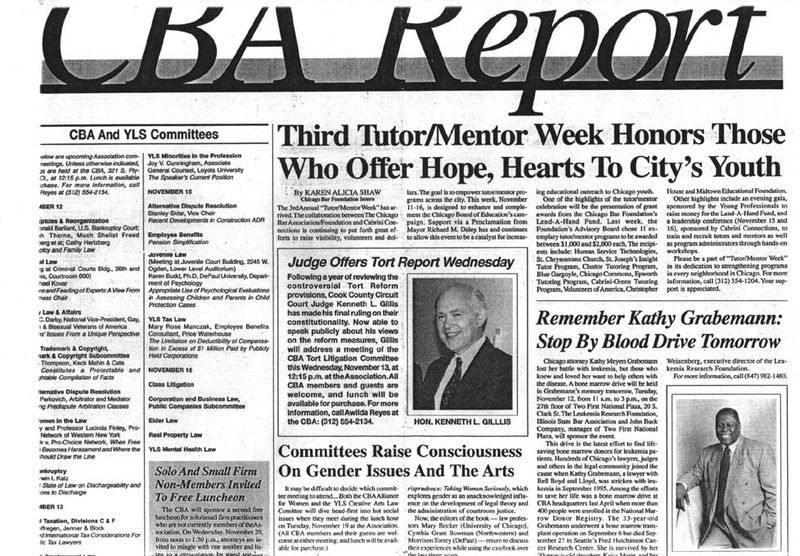 Since 1994 lawyers from the Chicago Bar Association have been raising visibility and dollars to support volunteer-based tutor/mentor programs in all parts of Chicago. While the amount raised and donated averaged between $25,000 and $50,000 per year from 1995-2006, the visibility that was created by events such as an annual Tutor/Mentor Week Event held in November each year from 1995-2000, led to a $100,000 grant from the estate of Judge Abraham Lincoln Marovitz in 2000 to create the Lawyers Lend a Hand to Youth Program. In 2006 a $2 million grant from the Chicago Sun Times enabled the annual grant pool to increase to more than $200,000 each year. 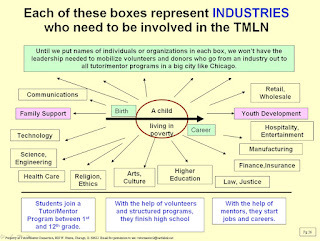 If leaders and volunteers in every industry and professional group were to duplicate this type of support for tutor/mentor programs in the entire Chicago region we could create multiple streams of volunteer and financial support for on-going operations of programs that need to stay connected to youth for many years to maximize their impact. That's the idea this chart represents. 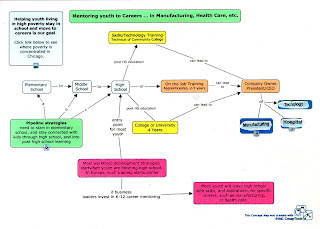 I created this in the mid-1990's to represent an idea I called "Total Quality Mentoring" which borrows from a Peter Drucker concept of Total Quality Management, or constant improvement based on learning from your own efforts, from the work of competition, and what the marketplace tells you. 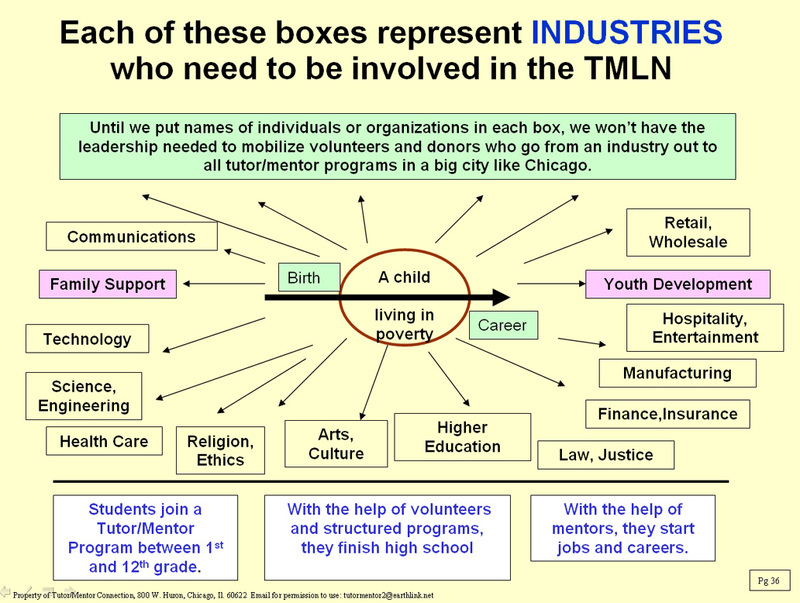 If teams of volunteers in business, universities, hospitals, professions, and religious organizations begin to adopt the concepts of TQM into their efforts to build and sustain mentor-rich youth support systems in all places where kids need extra help, we could change the way non-profits and social entrepreneurs are supported by changing how resource providers deliver their support. 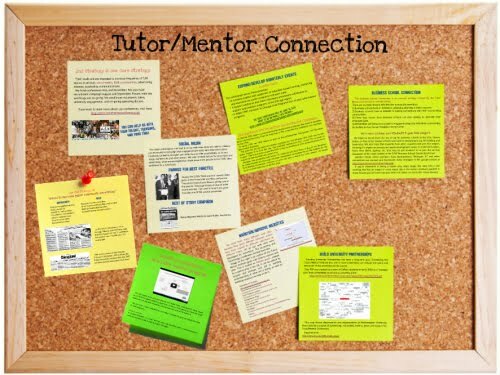 Read more articles on this blog and follow the links to other Tutor/Mentor Institute, LLC sites, and to the sites I learn from. Make this part of your regular learning and invite friends and co-workers to join you. There could be dozens of celebrations of mentoring taking place every month, in every part of the world. It just takes a small group of people to say "If it is to be, it is up to me." If you're interested in creativity, leadership, teamwork and/or collaboration I encourage you to read Christopher Borrelli's review of the new "Avengers" movie in today's Chicago Tribune. In one section he introduces readers to Susan Cain, the author of "Quiet: The Power of Introverts in a World That Can't Stop Talking," He wrote, Susan "told me, "In a group you can't truly explore your own mind, you can't fully examine your own ideas." She said: "I am not opposed to teamwork. I am opposed to how enamored of collaboration for its own sake our culture has become." And because teamwork is often strapped with a leader, "too often the most charismatic — or maybe with a superhero, the strongest — is viewed as the smartest and most creative." I looked up Susan's web site and found this Manifesto on her web site. This reminded me of an article I saw a while back titled 'Want To Be A Leader? ‘Learn To Be Alone With Your Thoughts’ in which says William Deresiewicz, "Speaking to a plebe class at West Point, said that without solitude, it’s hard to arrive at thoughts that are your own, and hard to develop the moral compass and moral courage necessary to act on those thoughts." In another article, I read about how it takes 10,000 hours of practice to become an expert in any field. This blog writes about the book "Outliers", by Malcolm Gladwell,which "puts forth the premise that to be an expert in your field requires a devotion to one’s craft for at least 10,000 hours." I'm sure others are spending their own time thinking about this and may have their own master plans and strategies. I hope we can connect on Facebook, Linked In, Twitter, the Tutor/Mentor Connection forum and/or the Conferences that I host in Chicago every six months. 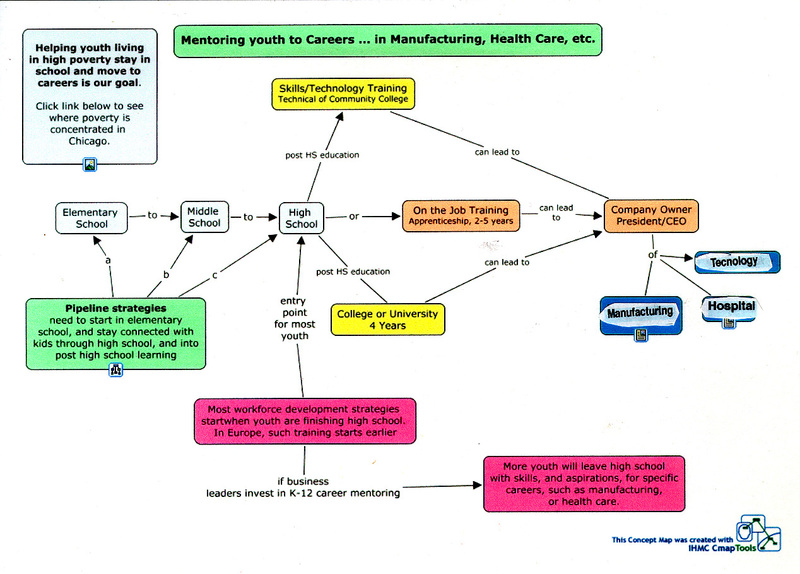 I use graphics like the one below to illustrate the long-term work required to help kids born of living in high poverty neighborhoods move through school and into jobs and careers. 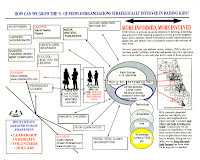 I use other graphics to illustrate that many leaders in every sector need to share ownership of this goal and that maps need to be used to assure that programs, dollars, volunteers and other resources need to be distributed to every neighborhood where kids live in poverty, have high drop out rates, and/or are victims of poverty. I've aggregated a collection of links pointing to blog articles, research and white papers written by experts. One group I've pointed to often is Public/Private Ventures. I just learned that they will be going out of business due to lack of funding. That's a shame because the reports they've provided offer tremendous insight into challenges and solutions. Here is one of the discussion where I've pointed to P/PV articles. One of the problems with writing a blog like mine and pointing to stories on media and research center web sites is that over a period of years the links erode because the stories no longer are found in the same places and/or the organization creating the information no longer exists or has created a new web site. I'm sorry to see the demise of P/PV, but I have even greater concern for how we'll all stay connected to the ideas they have shared for so many years. Even if I learn where the information will be hosted, it's not practical to dig back through all of the articles I've written to update my links. How do you handle this problem? Is there a solution? I connected with Edwin Rutsch who leads the Center for Building a Culture of Empathy during a discussion hosted by Ariana Huffington last week on Social Edge. Edwin is creating video interviews with people throughout the country and aggregating them on his web site. I was interviewed on April 25 and the interview can now be found on his web site. Edwin has invited me to create panel discussions among tutor/mentor leaders that he can record. I'd like to host one of these in mid June around the period of the next Tutor/Mentor Leadership Conference (June 14). If you'd like to participate please post an introduction or email me at tutormentor 2 at earthlink dot net.